It just takes 10 minutes a day to get started. Tackle the mail pile sorting it into three stacks one for important papers, the recycle bin and need to shred pile. Next day start with the pantry, fridge, junk drawer or your desk. Take your time and work up to an entire room. Be careful not to overdue it. Grab a box to add items you want to donate to your local charity. Clutter also affects the mind. There’s negative self-talk rolling through your head or the energy draining friend that talks about them self never asking how you are doing. All this stuff holds memories, reminders and promises – good or bad. It’s freeing to release stuff from the past. Once you’re hooked on the simplified space free from clutter, you’ll keep going! Next let’s clean up the computer, your calendar and online social life! Learn to say no! Only commit to what you enjoy and have time for and resist the need to over schedule yourself. Check your email twice a day then delete or archive them. Unsubscribe from eNewsletters you no longer need. How many social networks are you on? Are they all necessary? Free up space on your newsfeed by unfollowing and unfriending people you no longer get together with. A Princeton University study found when people do a task in an organized versus disorganized environment, physical clutter competed with the participant’s attention resulting in decreased performance and increased stress. Now how did that make you feel…to release ALL that clutter…too much stuff, too much to do and too much on our mind? You feel relaxed, less stress and more energy! Your space feels clean! Freeing your space and giving to others in need is powerful! 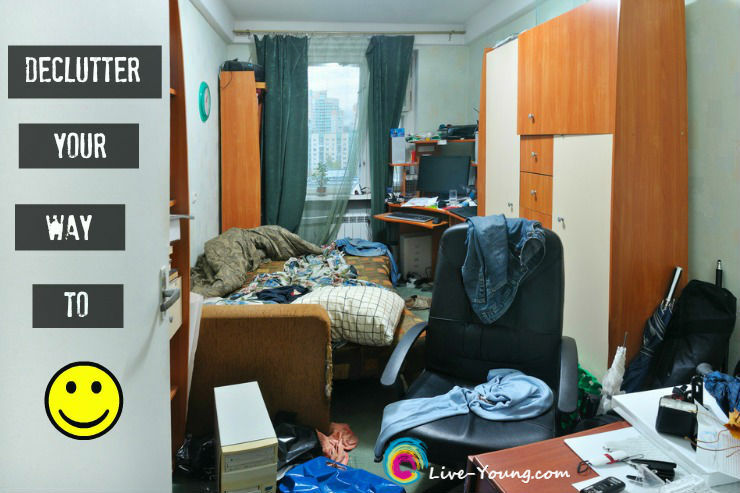 All it takes is 10 minutes each day to declutter your way to happiness! Check out this #1 New York Times best seller book that has changed people’s lives and started a decluttering craze: The Life-Changing Magic of Tidying Up: The Japanese Art of Decluttering and Organizing by Marie Kondo. Heal your body naturally and live young every day!